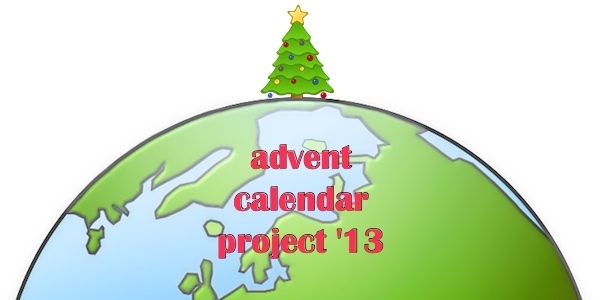 This week’s Advent Calendar Project ornament is inspired by a Ukrainian folk tale. “There once was a widow, who lived in a small hut. One day a pinecone dropped on the floor and it took root. Her children were excited that they would have a tree for Christmas. All summer long they made plans on how they would decorate the tree. They were very poor, so poor that they did not have anything to decorate the tree with. The widow went to bed on Christmas Eve knowing that the tree would not be decorated. Early on Christmas morning, the woman was awakened by her children. 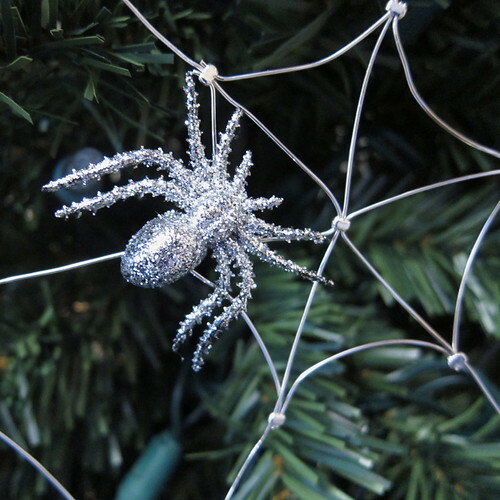 “Mother, mother wake up and see the tree it is beautiful!” The mother arose and saw that during the night a spider had spun a web around the tree. The youngest child opened the window to the first light of Christmas Day. As the shafts of the sun crept along the floor, it touched one of the threads of the spider web and instantly the web was changed into gold and silver. And from that day forward the widow never wanted for anything.” – from the Museum of Science and Industry Chicago. I struggled a bit with how to make the actual web. I wanted it to be metal, but didn’t want to get into soldering (though I have all the stuff to do it in Matt’s workshop). I wanted something anyone could do without investing in all sorts of equipment. I thought about pipe cleaners, but they weren’t delicate enough. Finally, I decided just to use beading wire held together with crimp beads. (I did have back up plans with jewelry glue or even cutting a web from a disposable baking pan.) In the end, I was quite happy with how it turned out and the web is stabler than I expected. 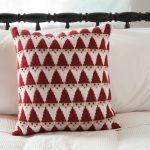 I want to try my hand at making a more intricate one. I made this as a Christmas ornament, but I am totally also pulling it out for Halloween or maybe making a big corner version. 1. 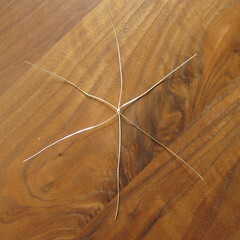 Make the base of the web – Cut three lengths of wire all the same size. These will be the straight “arms” of your web, so make them as long as you want your web to be wide. 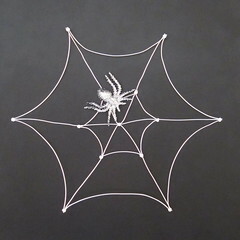 (My web is 7″ across which I thought looked appropriate to my spider.) 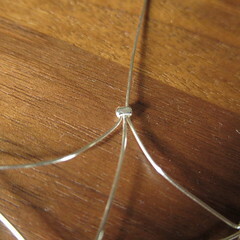 Insert all three wires into one crimp bead and slide the bead to the middle. Make sure the ends of the wires are even. Tightly crimp the bead with pliers. It is important to really crimp the beads tightly, so all the wires stay in place. I crimp them at least twice, once on each side. Spread the six arms out evenly. 2. 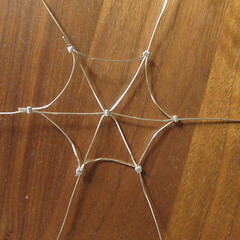 Make the connecting webs – Decided how far near the center you want your first set of connecting webs. Measure the distance between the arms at the point. 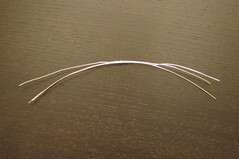 Cut six pieces of wire sightly longer than that distance. Slide a crimp bead on one of the web arms. Insert two of the six wires you just cut into that same bead. Place where you want the connecting web and crimp in place. 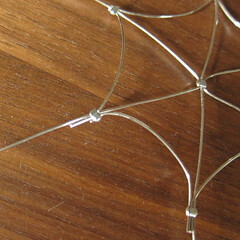 Don’t worry if the ends of the connecting web wires stick out from the bead a little, you can trim them afterwards. Continue working around the web until you have six connecting webs. Repeat further up the arms of the web making longer connecting webs. I kept mine simple and only did twice around, but you can make it as intricate as you want. 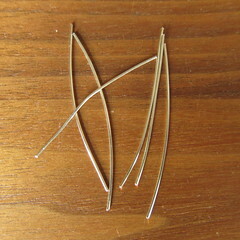 Once the last round is attached, trim the ends of the wires. 3. 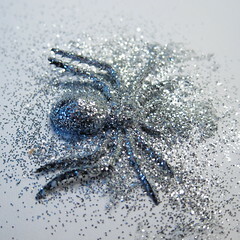 (optional step) Glitter spider – I had hoped to find a silver spider, but all I could find was black plastic. I painted it with some glitter paint and then covered it with more silver glitter. You could also use glue and glitter. 4. Glue the spider to the web. 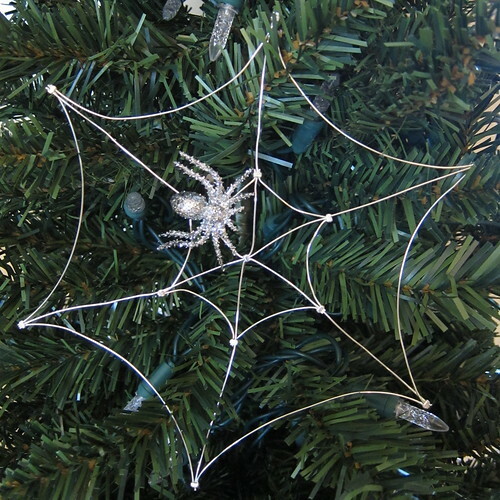 I used tacky glue and glued the spider on a crimp bead and wire. 5. 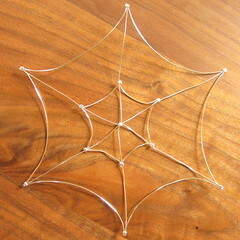 Nestle in the Christmas tree or add a wire or ribbon to hang. I make beaded spiders. They would work wonderfully with the web! Thank you for posting this!! 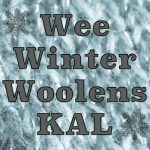 My aunt’s foster kid from Ukraine is coming for Christmas and I’ve been looking for ways to incorporate some of her native traditions into our Christmas holidays! !